Load bearing components are all made of die-cast aluminium, with milled seats for bearings and spindles. Size : 10", 12", 15" and 18"
Thickness : 1/2" to 8"
- Size: 12", 18", 24", 30"
Note: "For Detailed Specification Information Refer To PDF"
2 blades fitted in cutter block, spanner for fitting planner blade, meter gauge, motor pulley and fixing plate with electric motor & starter. Owing to the diverse and increasing needs of patrons, our company is offering a large range of Thickness Planer Machine. To smooth and flatten boards, our product is highly demanded. 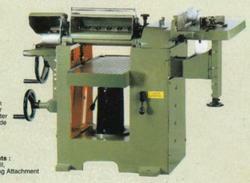 The Thickness Planer Machine offered by us is available in accurate dimensions and robustness. This is a versatile machine designed to handle multiple tasks. Besides the main operations of Surfacing, Thicknessing, Sawing, Rebating of wooden planks, with additional optional attachments, it is also suited for grooving, drilling, grinding and moulding too. 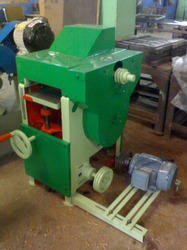 Thickness Planer, Moulding With Blade Grinder MTMB 18"
In order to keep pace with never ending demands of the customers, our company is instrumental in presenting excellent quality assortment of Thickness Planer.